External mounted level sensors for installing on the outside of a liquid storage tank to measure level of tank contents. 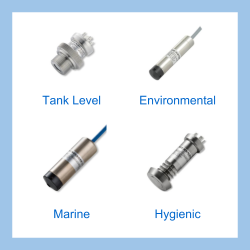 These level sensors have a screw-in, clamp or bolt-on flange fitting to attach the sensor to a connection port on the external wall of the tank. LMK351 High Overpressure Flush Level Transmitter- Flush capacitive ceramic pressure sensor for measuring corrosive and viscous liquid level from levels 0.4 metres of water up to 200 mH2O. DCL 531 Modbus RTU RS 485 Submersible Stainless Steel Liquid Level Sensor- Digital submersible stainless steel liquid level sensor with a Modbus RTU protocol RS 485 serial bus interface. DPT200 Pressurised Tank Level Differential Pressure Transmitter- Pressurised tank liquid level differential pressure cell transmitter for process plant storage. LMK331 Screw-In Ceramic Level Transmitter- Level pressure sensor with semi-flush ceramic diaphragm and stainless steel or PVDF wetted parts in ranges from 0-4 to 600mH2O gauge. DS200 Combined Hydrostatic Level Switch, Gauge and Sensor- Three in one hydrostatic level switch, digital level gauge and level sensor with level ranges from 1 mWG up to 600 mWG (3.3 to 1969 ftWG). Send us your enquiry for External Mounted Tank Level Sensors to get assistance with this product type.